The Fiat 1100 is an automobile produced from 1937 to 1969, by the Italian car maker Fiat. The Fiat 1100 was first introduced in 1937 as an updated version of the 508 "Balilla" (its real name was the 508C) with a look similar to the 1936 Fiat 500 "Topolino" and the larger 1500, with the typical late-30s heart-shaped front grille, with styling by the emerging designer, Giacosa. Setright, L. J. K. "FIAT: The Godfather of the Italian Motor Industry" in Northey, Tom, editor. World of Automobiles (London: Orbis Publishing Ltd, 1974), Volume 6, p.660. It was powered by a 1089 cc four cylinder overhead valve engine. Drive was to the rear wheels through a four speed gearbox, and for the period, its comfort, handling, and performance were prodigious, making it "the only people's car that was also a driver's car". Subsequently the car underwent a partial restyling around the front end and gained new streamlined window-shaped louvres and was re-named the 1100B and popularly known as the "1100 musone" (i. e. "big nose"). 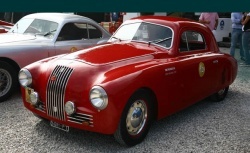 After World War II, in 1949, the car was re-introduced with a curvy trunk and new name, the 1100E. Both the 508C and the 1100B were also available as the long wheelbase 508L and mainly used for vans and taxis. In 1953 the 1100 was completely redesigned as a compact 4-door sedan, with a modern monocoque bodywork and integrated front lights. The new model was called the 1100/103 after its project number, and was offered (as usual at that time) in two different versions: "economica" (cheaper) and "normale" (standard). The car became available in a sporty version, the 1100TV with a third light in the middle of the grille and in station-wagon version, with a side-hinged fifth door at the back. Between 1956 and 1960 the new 1100 underwent several slight changes in fittings and details, e.g. newly designed grille, more rectangular profile, dual color dressing, and eventually small fintails with spear-shaped backlights. A special version, the 1100 Granluce (i.e. "Large light"), without suicide doors, launched in 1959, had both fintails and wider windows. As an option it could be fitted with a new powerful 1221 cc engine. Starting with the characteristically late-30s nose of the 1100, Bertone broadened fenders, although the headlamps remained as separate units nestled in the catwalk between fender and hood. The fenders were also lengthened, as were the doors, which were also reversed to hinge at the rear. The result was a car that looked totally up to date. Retaining the exterior changes of this model, in 1962 Fiat introduced the 3rd generation 1100, called the 1100D. "D" stood for Delight. It was a sober yet comfortable 4-door sedan, very similar to the Granluce but with simpler sides and a new simpler rectangular mouth. The 1100D was a successful Italian standard in the early sixties and along with its own estate car version survived without any substantial alteration until 1966, when the introduction of the groundbreaking 124 model imposed a further change in styling. 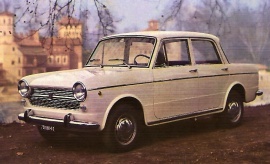 The Fiat 1100D was made in India from 1964 onwards. In 1973 (for that model year alone) it was named the Premier President. 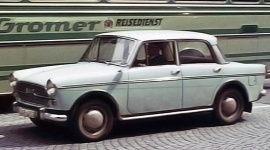 From 1974 onwards until it was finally discontinued in 2000, it was known as the Premier Padmini. The very last 1100 model, born that year, was the 1100R (R = Rinnovata). It had a longer, straighter and slimmer line, with a square back and a front-end look not so different from its bigger sister the Fiat 124. In terms of styling cues, the vestigial fins were further suppressed and the simple round rear light cluster from the Fiat 850 replaced the vertical form seen on the 1100D. At the same time, the larger engine was withdrawn in order to avoid undue overlap with the 124. The 1100R was offered only with the older 1089 cc engine, now with a compression ratio of 8:1 and a claimed output of 48 bhp. The boot/trunk was usefully expanded, helped by a slight increase in the car's overall length, and with more careful packaging of the spare wheel (under the floor) and the fuel tank (in the rear wing on the right). As configured for UK sales, reclining front seats were available as an optional extra for £8. The 1100R finally gave way in 1969 to the new middle-class Fiat 128. 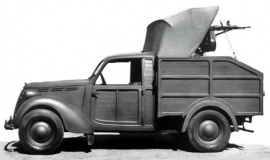 The 1100T was made from 1957 as a van , pickup and bus. The car is equipped with a in-line engine with 1089 cc (type 103 D.007) with (28 kW; 37 hp) at 4800 rpm, it got top speed of 90 km/h (56 mph). 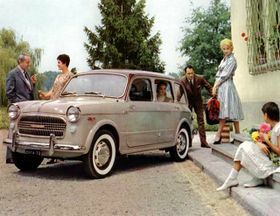 In 1959 was unveiled its successor, the Fiat 1100 T2 that has 45 PS 1222 cc engine.